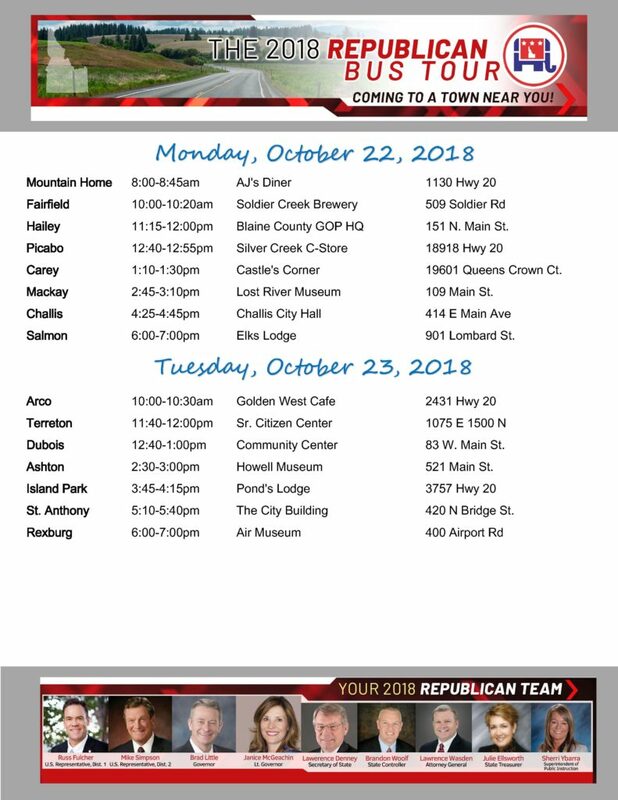 Home » News » The 2018 Idaho Republican Bus Tour: Coming To a Town Near You! 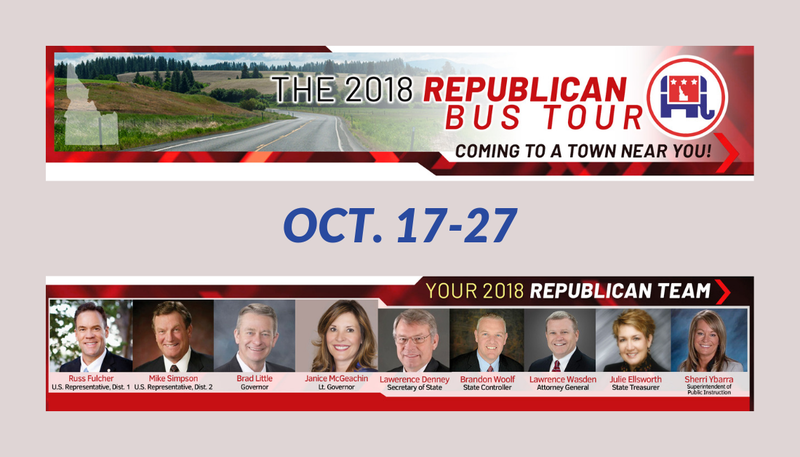 The 2018 Idaho Republican Bus Tour: Coming To a Town Near You! 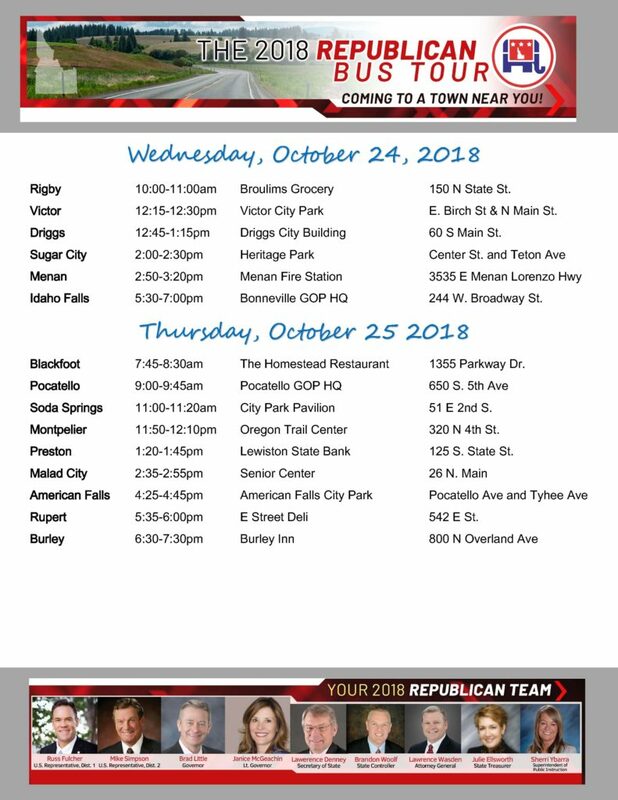 From Oct. 17 through Oct. 27, your Republican candidates will be traveling across Idaho for the 2018 Republican Bus Tour! 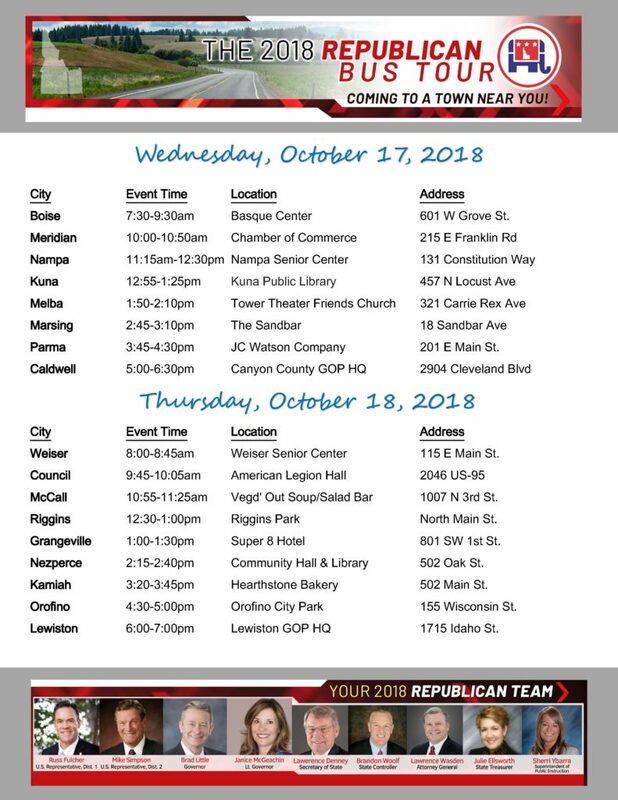 We invite you to come meet and listen to our candidates, including Brad Little for Governor, Janice McGeachin for Lieutenant Governor, Russ Fulcher and Mike Simpson for Congress, Lawerence Denney for Secretary of State, Brandon Woolf for State Controller, Lawrence Wasden for Attorney General, Julie Ellsworth for State Treasurer, and Sherri Ybarra for Superintendent of Public Instruction. Local Republican candidates for state legislature, etc., will also join in for parts of the tour. Here is the full schedule. We hope to see you! 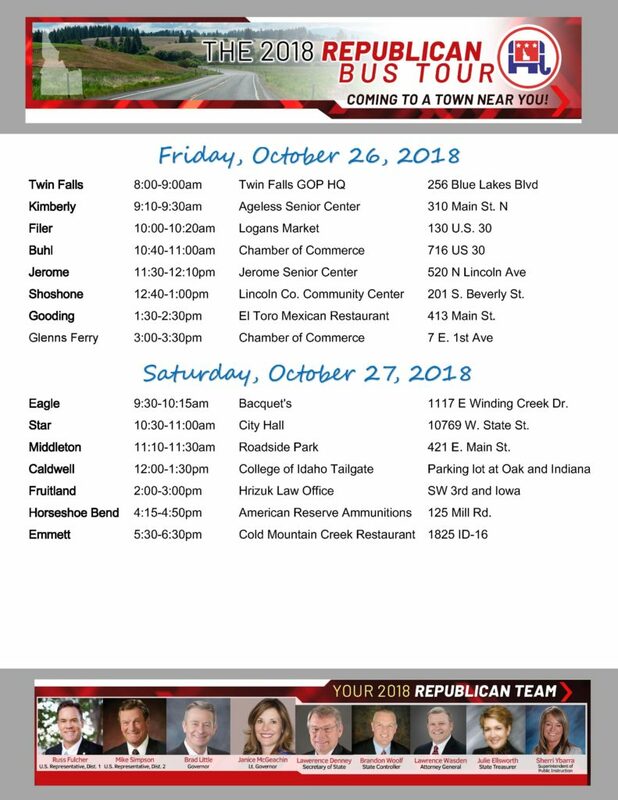 Contact us at info@idgop.org or (208) 343-6405 if you have any questions. 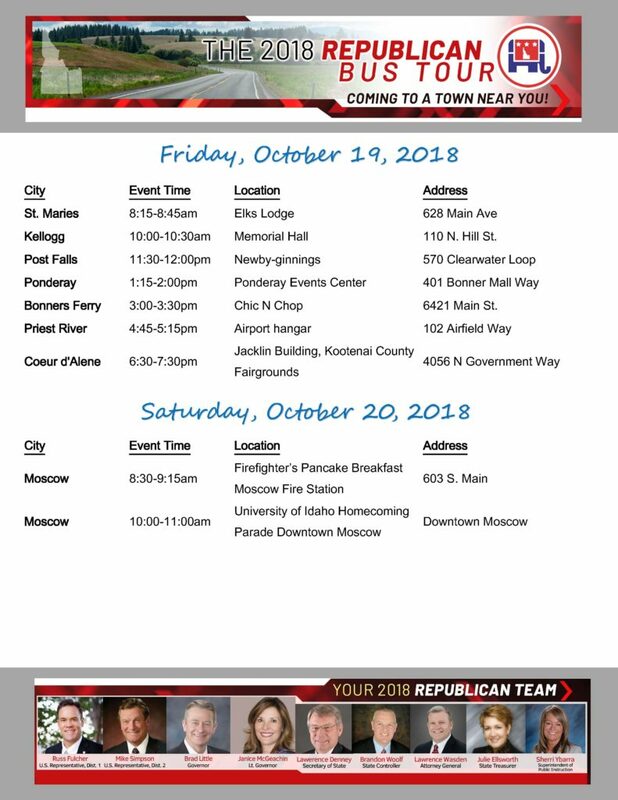 October 5, 2018 / In Elections, News / By Idaho GOP / Comments Off on The 2018 Idaho Republican Bus Tour: Coming To a Town Near You!